OH MY! LOOK AT MY YARN PRON! Do you know what this yarn pron is???? I've been checking my mail every day anxiously waiting for it to arrive. What is it? You ask. It's The Yarntini Sock Club! Look at what is in this month's kit! 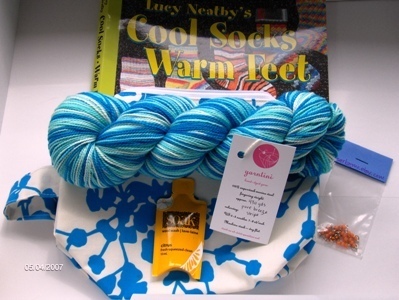 I see Lucy Neatby's "Cool Socks Warm Feet. A really cool Misocrafty sock knitting pouch THAT matches the Yarntini colorway of Pure Breeze Stripe. AND if that is not enough it had some neat stitch markers that were made by Sarkasmo. Now, I know all this was put together by Yahaira at Pure Knits. Great Job. Thank BOTH of you so much!